DEMOGRAPHIC DETAIL: For each broadcast program (or hour segment), the chart below displays preliminary live+same day key advertiser demographics (adult 18-34, 18-49 and 25-54 ratings), audience skews (women 18-49, men 18-49 and adults 50+ shares) and total viewership (thousands of people over the age of 2). ABC: THE GOLDBERGS dropped 0.2 to a series low 1.1, but the rest of the line-up was more steady. MODERN FAMILY was down 0.1 to 1.3, while AMERICAN HOUSEWIFE (1.0), the just-backordered SINGLE PARENTS (1.0) and A MILLION LITTLE THINGS (0.8) were steady. CBS: SURVIVOR fell 0.2 to 1.4, and both SEAL TEAM (0.8) and CRIMINAL MINDS (0.7) were down 0.1. NBC: CHICAGO MED (1.2) and CHICAGO FIRE (1.3) were each down 0.1, and CHICAGO PD held at 1.2. FOX: EMPIRE stayed at 1.6, and STAR was down 0.1 to 1.2. 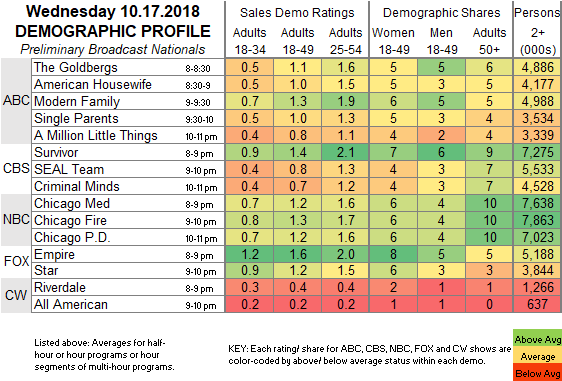 CW: RIVERDALE lost 0.1 to 0.4, and ALL AMERICAN was steady at 0.2. Tonight, ABC preempts GREY’S ANATOMY for the seasonal specials IT’S THE GREAT PUMPKIN, CHARLIE BROWN and TOY STORY OF TERROR. 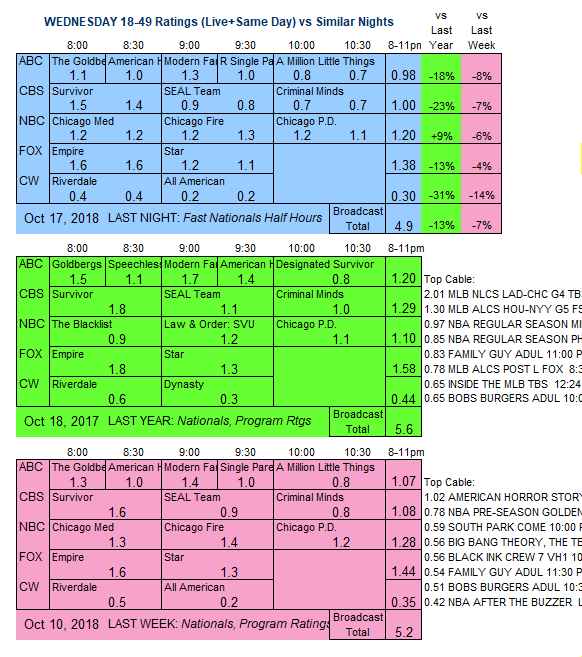 COMPARISONS TO SIMILAR NIGHTS: Preliminary adult 18-49 live+same day ratings versus the same night last year and same night last week.